It would be a shame not to do so, for Raquel’s account of her formative years is a deeply inspiring one. In adulthood, she has defied convention as a woman and a Filipino, rising above her circumstances to reinvent herself with a great deal of creativity and hard work. Raquel recalled that her parents separated when she was only seven years old; she and her brother were left in the care of their grandparents who lived in the remote mountains northwest of Cebu City. It was the 1980s, and the area was a hotbed of Communist insurgents (“some nights we woke up to gunfire when government troops clashed with the rebels”). Living a hardscrabble existence without electricity and running water, Raquel took comfort in her grandmother’s tales of Maria Cacao, a benevolent mountain fairy. 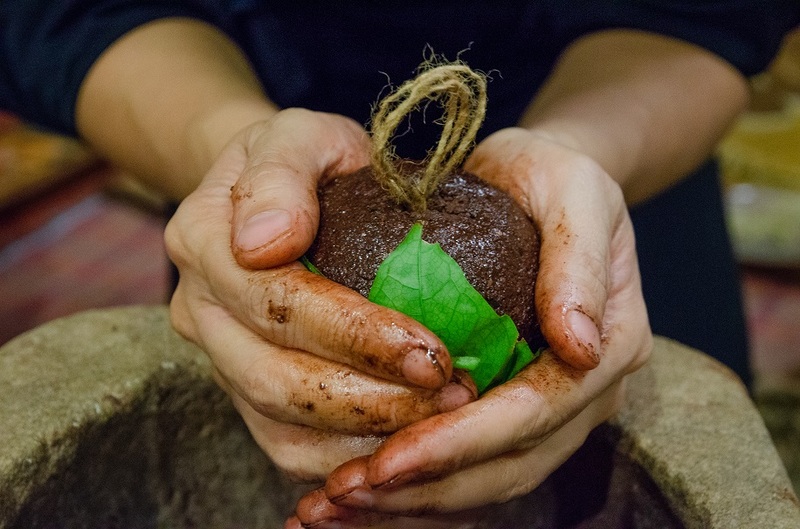 She was the queen of a cacao forest who traveled on an invisible ship down the rivers to the open sea, setting out to export her cacao around the world. Each time her ship docked, Raquel’s grandmother said, it would turn to gold. Raquel’s parents eventually reunited after six years and the children moved out of the mountains to join them in the overcrowded capital Manila, where they once lived. But life became even more difficult. By the tender age of 14, Raquel had taken on a series of odd jobs: becoming a housemaid, doing laundry, selling candles, flowers, and shirts. She picked up garbage, entered a slaughterhouse to collect blood from the freshly killed pigs, and even ran an informal street-side canteen. She explains all this over tea and pralines at Casa de Cacao, her onetime family home that has since been turned into a mini-factory (for lack of a better word) where cacao beans sourced from small farms in Mindanao are hand-roasted and processed for Raquel and Edu’s artisanal chocolate company Ralfe Gourmet. “We go directly to the farmers, cutting out the middleman, and pay international prices so they get a fair deal,” Edu says. I watch intently as Raquel begins pounding cacao nibs into fine grains in a stone mortar. She passes me the long timber pestle to give it a try, but I am clumsy and cannot replicate her technique, which allows the pestle to swivel while in constant vertical motion. “See?” Edu chuckles. 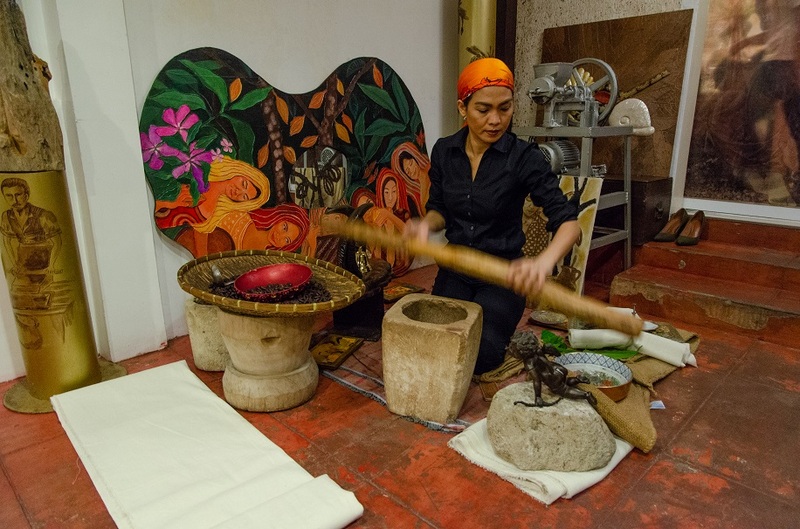 “She makes it look so effortless!” It strikes me how the tablea-making process is a sensory experience that doesn’t just involve sight and smell and taste. “Can you hear it?” Raquel asks me. 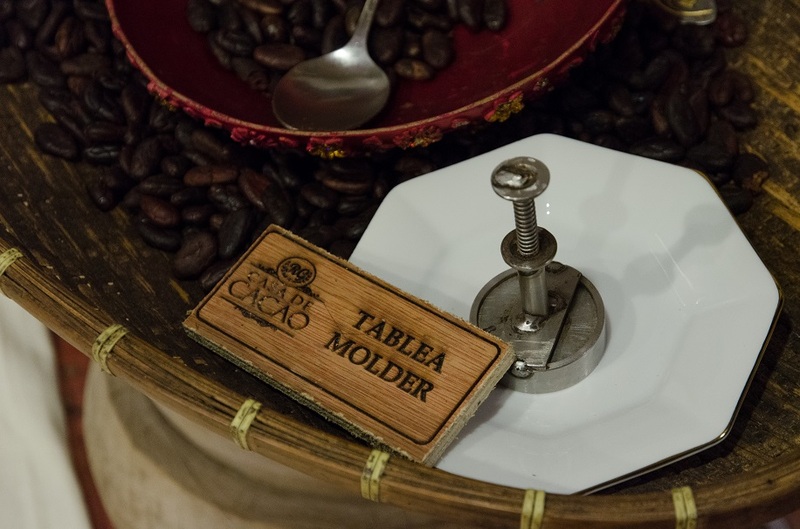 “The cacao nibs are moist.” She spoons the mixture into a circular, stainless steel tablea mold, presses down on the plunger, and voilà – a new disc of tablea pops out. Next up is the non-traditional cacao de bola, a solid, perfectly formed ball of the broken-down, compressed cacao, shaped entirely by hand and with a knot tied into the top. As she rolls it in her palms at lightning speed, the cacao oil rises to the surface and lends the ball a noticeable sheen, sealing in its flavor. This is Raquel’s own reinterpretation of the queso de bola, balls of Edam cheese coated in red paraffin wax that are a fixture at Christmas gatherings all across the Philippines. We move onto a cooking station where several discs of tablea are dropped into hot water in a tall earthenware jug called a chocolatera. As the cacao tablets melt, the sikwate is stirred with a batirol, a wooden whisk equivalent to molinillos in Mexico. Raquel vigorously rotates the batirol between her palms to aerating the cacao water and give it froth. 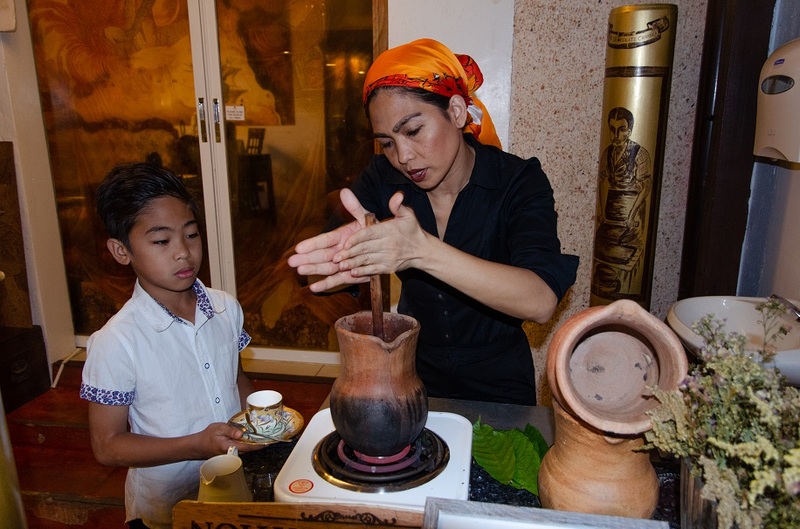 With the help of her youngest son, JP, who materializes midway through the demonstration, she pours the hot cacao into a teacup. I’m advised to take a sip and splash the drink around the palate like fine wine. Raquel’s sikwate is a revelation. It starts off predominantly sour, progressing to a rich earthiness and then a long, nutty aftertaste. It is like no other hot chocolate I’ve tried before – deeper, more complex, and vaguely reminiscent of the fine local espresso found on the Indonesian islands of Flores and Sulawesi. Wonderful story! This is something I have not known before. A very interesting story. I grew up in Hershey, Pennsylvania, home of the American sweet milk chocolate and have had the Mexican unsweetened version which is sometimes flavored with spices, but this is the first I have heard of the Philippines version. Hershey’s were a big part of my childhood – I love chocolate kisses and its cookies ‘n’ creme nuggets are still a firm favorite. I’d love to visit Mexico and taste the traditional hot chocolate in the land where it came from! Raquel has a wonderful story to tell, and I’m so glad she is working to reteach people the traditions. 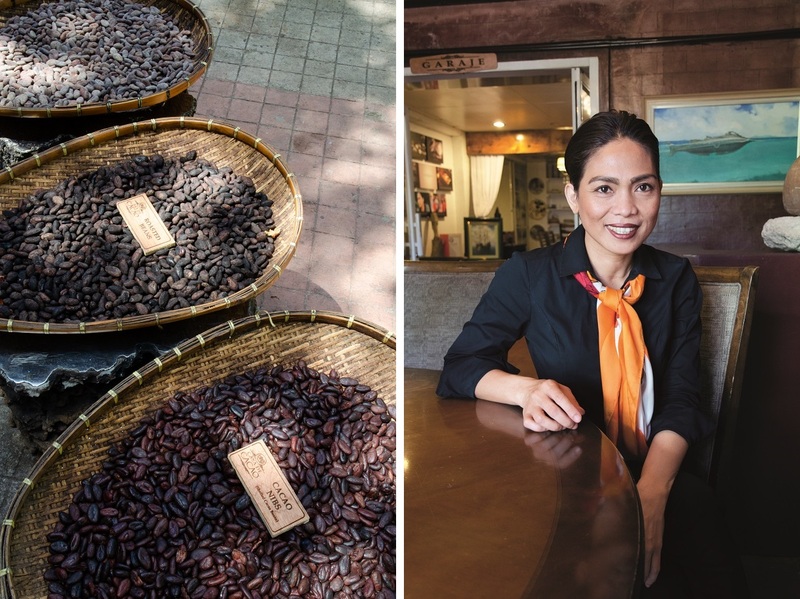 I loved learning of the chocolate connection between Mexico and the Philippines. I sincerely hope you can visit Mexico, and Oaxaca in particular soon! You’re welcome, Marilyn – and thanks too for recommending Mina Street in Oaxaca! Mexico has been on my mind the past couple of years, especially because of posts from some of my favorite bloggers like Lex (One Foot Out the Door), Alison (Adventures in Wonderland), and Jeff (Planet Bell). It is a pretty big undertaking to get there from this side of the Pacific but I would so love to visit in the next couple of years! I sense you have a very open heart, James. Truly, my biggest vice, my Achilles Heel, is good chocolate. So it is with keen interest and appreciation that I read your story about Raquel. Thanks for sharing this with us! Well, Eric, if good chocolate is your biggest vice, you must be practically a saint! Thank you for the kind words and for reading this all the way through. This is an example of how understanding the history of the local food (in this case, beverage) can teach us so many things. Humans always move from one place to another whether it’s out of necessity or because there’s a better opportunity in the new land, and people usually bring their recipes wherever the wind takes them. It’s so fascinating to learn about the traces of Spanish colonialism in the Philippines and how the Cebuanos still call hot chocolate with the name known in Nahuatl. Meeting Raquel and getting the opportunity to talk to her and to listen to her inspiring story must have been one of the highlights of your trip to the Philippines! This made me think of whether there’s someone like her in Indonesia who’s so passionate about … chilies maybe? Absolutely, Bama. It’s all too easy to look at food in a superficial way, saying only that it tastes good while remarking on the presentation, when it provides a means for getting to know the culture and history of a place. Raquel was a bit surprised to find out that Indonesia doesn’t have an indigenous chocolate-making tradition like in the Philippines, but then again I guess the only other part of the world that does is Mexico and some of the other Latin American countries. You had me with the word chocolate in your title—a favourite food group of mine! Chocolate (particularly hot chocolate) and the Philippines, who would have thought they go together? And what a fascinating and inspirational story about Raquel’s life. The Philippines continue to surprise me. Thanks for sharing this lovely story and interesting history of how chocolate came to the country. My pleasure, Caroline! I too am a bit of a chocolate fiend and will just about try it in any shape or form. I also love food history so meeting Raquel was one of the major highlights of my stay in Cebu. That experience has completely changed the way I think about cacao and chocolate – naturally I couldn’t leave without buying some handmade tablea to take home! Glad you enjoyed it – thanks for reading and commenting. And here’s that Mexico-Philippines link you alluded to last week! Fascinating connection, especially the linguistic link (always my thing). And what a great personal story, too – Raquel’s life has been quite a saga; she looks way too young (and is absolutely gorgeous, by the way) to have lived long enough to do what she has done. It’s a good thing I didn’t set you up for disappointment! I was immediately captivated when I met Raquel – she had such presence and a magnetic aura when she walked into the room. I could see why people dub her the “chocolate queen” given those traits, her grace, and her radiant appearance. what an amazing story and process! Thank you for including the history and its original uses, makes me want to visit! You’re more than welcome. 🙂 Hope you get the chance to explore the Philippines soon! Two things struck me about this fascinating story – first your beautiful perfectly placed photos, and second how incredibly young (and beautiful) she is – after 8 children! Well she’s obviously much more than that but I expected someone older and more worn given the life she’s had. What an extraordinary woman she is. But I must say, having a sweet tooth and not liking any bitter foods I’m not that anxious to try the drink. Thanks so much, Alison – I could not imagine keeping Raquel’s amazing story to myself! You could always mix some condensed milk into the hot cacao; I tried doing that after having the unsweetened version and it was simply fabulous, with just the right amount of sweetness. Fascinating story and like Alison said, great photos. I never really thought of there being a link between Mexico and the Philippines but it makes complete sense now. Stumbling across that hidden link – and reading your many blog posts from that part of the world – has made me want to visit Mexico even more. I’m looking forward to trying hot chocolate in the country where it was first invented. Mexico is objectively one of the best countries in the world – It has more pyramids than Egypt, thousands of miles of beaches, hundreds of wonderful colonial towns, rugged mountains, a vibrant culture and awesome festivals like the Day of the Dead. You will love it when you go! James, your open heart is evident in the eloquently narrated story of this remarkable woman. 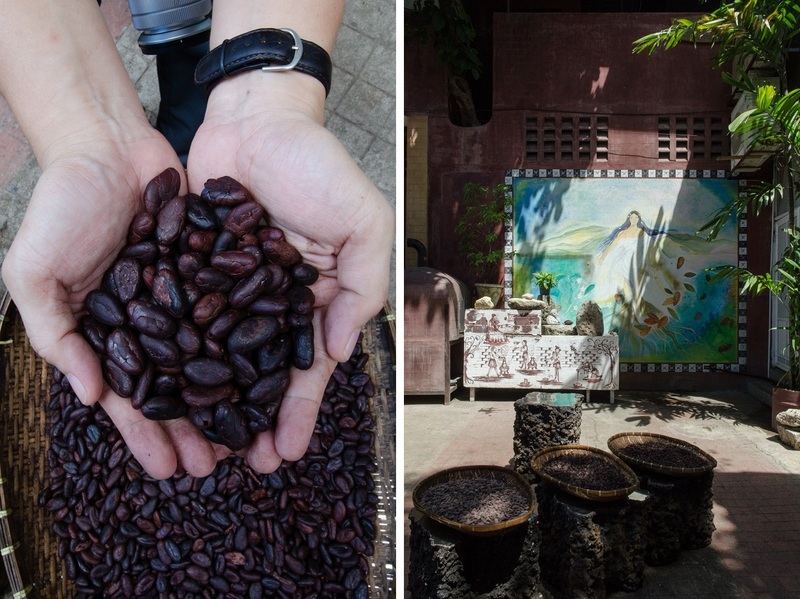 I was clueless about Filipino cacao culture. Raquel’s mission to preserve and promote it is inspiring. Thank you for the kind words, Madhu. Raquel’s life story left me completely in awe – and I have to say that no hot chocolate I’ve had since then can compare to the cup she prepared for me in Cebu. Such an admirable artisan! I think it’s her fate to become a chocolatier 🙂 Thanks for the great story, James!